Ozzy Blackbeard: Biba Maxi Coat of my dreams!!! Spoiler: I flipping love this coat, and there are loads of photos!! Turns out I have a lot to say about it, so I'm going to give each bit heading. The inspiration for this was really random! One day, at the end of last April, I saw a bit of a UK antiques TV programme called Flog It. People bring along old stuff they don't want anymore, and it gets valued and then sold at auction. Well, a lady brought along this absolutely amazing Biba Maxi Coat that she'd bought in the Biba shop back in the 1960s. Here's a thing from the V+A website about the history of Biba; I know the Biba styles aren't for everybody, but I love them. The coat sold at auction for £70, which I thought was frankly criminal - it should have sold for way more! But then I just couldn't get it out of my head. First thing to do was to pick a pattern. 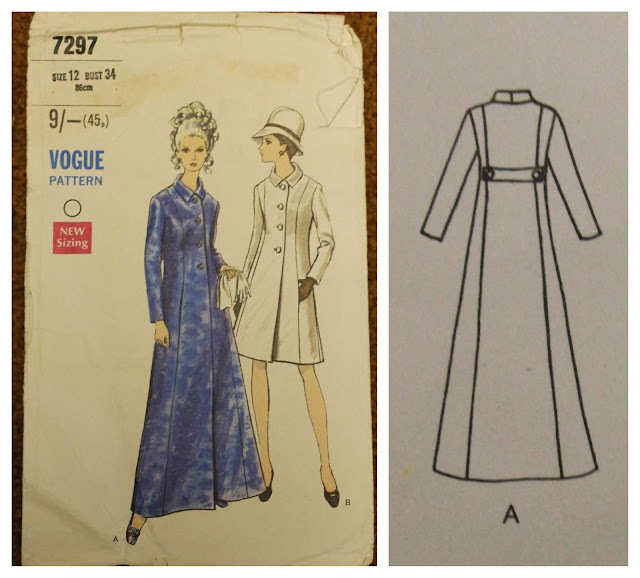 I was originally going to use Vogue 8346, which I used for The Coat; but in a last minute shocker, I used the By Hand London Rumana coat pattern. I made the Rumana coat this time last year, and for all it's issues, it's a better fit on me in the shoulders. cut the front sides as one piece, and added an in-seam pocket between the front side and front. widened the princess seams from the waist down to make the skirt more A-line. extended the centre front over to the princess seam to make it double-breasted. Then, for good measure, I added in some details from three other patterns. The collar and neckline are from Style 4828, which is a vintage pattern I got on ebay. The sewing fairies were on my side, and the back of the collar fitted perfectly onto the Rumana back! I used the shape of the front neckline, and made the lapel a bit bigger and more curved. The only change I made to the collar was to make the outside edge more curved. The in-seam pockets and Martingale on the back are both from Vogue 7297, another ebay vintage pattern find. And finally, the sleeve tab thingies at the cuffs (anybody know the right name for these?? ), are from Vogue V1537, which I made here. I used just less than 5 metres of fabric (the joys of being small! ), and am thinking of a 1970s A-line skirt for the left overs. Biba as a brand is now sold in the House Of Fraser in the UK, but it's not the same as the old Biba. Ages ago my sister had bought a Biba duvet cover, and last year she was throwing it out. As she knows better than to put a big chunk of fabric in the recycling, she gave it to me. The duvet top has an amazing pattern that will be the lining for a shorter coat, but it had little Biba labels on it. So I unpicked one from a pillow case, and sewed it into the back facing. As previously mentioned, the herringbone fabric is from Fab Works. The lining fabric is from ebay, and the buttons are from Totally Buttons. All the interfacing is from Tailor Mouse. I used medium weight fusible canvas for the fronts, back facings, the undercollar and the top of the sleeves. Then used lightweight woven fusible for the front facings and the bodice to the waist. Whilst this might seem a bit "describing to the nth degree" (for want of a better way to put it), I find that how to interface a coat is probably the trickiest bit, so want to mention this if it helps someone else. I am absolutely no expert on this, but I think that it very much depends on the main fabric as to where and how much to interface. My fabric is more drapey than most coating fabric, but I think this is to do with the herringbone weave. It reminded me a bit of linen, in that it is a thicker fabric, but because the individual threads are thick, then it frays easily. I hope that makes sense! So I thought it would be a good idea to use the lightweight interfacing to the waist on each of the body pieces to help keep it's shape, and also to support the weight of the maxi length skirt. I also made a back stay, and a stay for the side front pieces. Coat front interfacing on left, and front facing interfacing on right. It would have helped considerably if I had taken this photo before sewing in the lining! These are the two interfacing pieces that go onto the front shoulder. The underneath one is canvas interfacing, and the top one is woven interfacing. This is from the Alison Smith class mentioned below. The grey bit I'm holding back is the shoulder pad. Then, because the coat skirt is cut slightly on the bias, I thought it would be a good idea to stablise the seams so they wouldn't stretch out under their own weight. So I cut 2 cm on-grain strips of the lightweight interfacing, and pressed it onto the edges of the seams before sewing them together (but forgot to take a photo!). You'll see that I also overlocked all the seams, and this was because of the fraying. a marvelous book called "Tailoring: The Classic Guide to Sewing the Perfect Coat"
a Craftsy/Bluprint class called "Essential guide to tailoring: structure and shape" by Alison Smith. 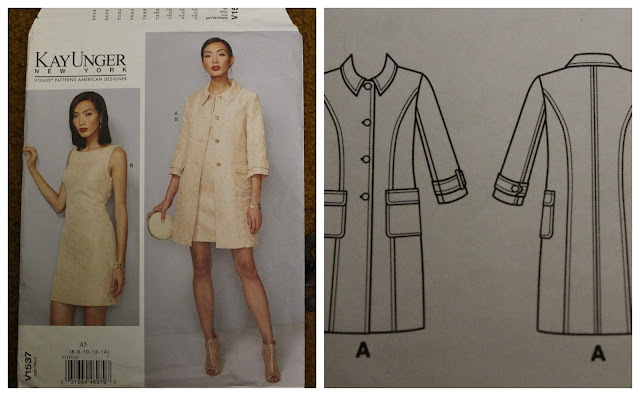 This class is brilliant, it shows three different ways to interface jackets and coats, and includes drafting the back and side stays. I used the Modern Tailoring method. The bound buttonholes were made using the "The Bound Buttonhole Ebook" by Karen Ball from Did You Make That? Unfortunately it doesn't seem to be available to buy on her blog anymore. None of the above are affliate links, and I bought everything myself with the exception of the book, which was a present from my sister. I just wanted to link everything to make it easier to find if anybody is interested. If you've been hanging around here for long enough, you'll know I'm very fond of making coats! It really is a case of necessity being the mother of invention for me, as because I'm so small, I can only get coats in Petite sizes and the styles are very limited. I know a lot of sewists are really put off by making a coat, as it seems so difficult. But, honestly, if you can make a shirt or blouse with a collar, then you can make a coat - the principles are exactly the same. Maybe a good starting point would be an unlined coat like the Deer and Doe Luzerne trench coat (which I'm hoping to make soon as part of my Make Nine), or the Tessuti Berlin Jacket that my lovely friend Suzie made here. I've seen Suzie's coat in real life, and it's amazing. I think really the worst part of making a coat is how long it takes. This coat took me about five or six weeks to make (I had little breaks in between); I made a good start during the Christmas holidays, and then did most of the rest at the weekend, and the odd hour or so at nightime. So time is definately something to factor in. If you can't tell already, I flipping love this coat and shall be swanning around in it until the weather warms up - which in Belfast could be about May (and I'm not joking!!). When I was taking my photos I had the radio on, and the Blackbeard Sewing Room radio station of choice is Planet Rock (because they play songs I know the words to). As I was clicking, they played 19th Nervous Breakdown by The Rolling Stones, who I adore. It seemed very fitting to have a 60s Stones song while photographing my 60s inspired coat, so I had to have a boogie! If you've got this far then I congratulate you, and happy sewing! Woooow, that is just an AMAZING coat! Iris really true to the original and fits perfectly and honestly, you did an awesome job!!!! Absolutely fabulous!!!! Thanks for the links and the photos! Kisses from Greece! Thank you! Glad the links are helpful. I watched the programme too and remember thinking if I'd been able to bid, it would have been mine ! A superb interpretation by you and such a stylish coat with great fit. Some time ago I managed to pick up a vintage 'Bus Stop' jacket in black velvet, perfect fit for £4, sometimes we get lucky! Ooo! I loved how the lady who valued it was so enthusiastic about it, and I totally would have bidded too!! I haven't heard of Bus Stop, and just had to google it. Oh. My. Goodness!!!!! How did I not know about this??!! So much inspiration - thank you!! And what a bargain on your jacket, happy wearing! Ooooh! What an absolutely stunning coat Lynne! I loved seeing all of the detailed close-ups and the insides too. No wonder it took a long time to make as there is a lot of work in it. A labour of love. Thanks Diane! 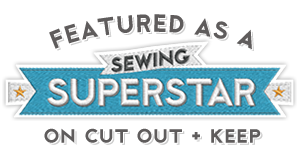 After sewing a coat, everything else feels like it takes five minutes to do! I am in totally in awe of your sewing skills Lynne, the pattern matching on that beautiful collar, lovely buttonholes and the insides. Your coat is staggeringly beautiful on you. Thank you for all the closeups and details. 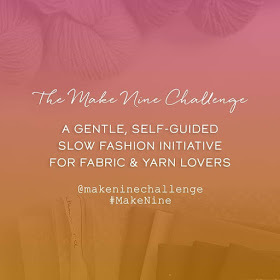 You are so inspiring and I may have to plan to make another wool coat this autumn. Thanks Elaine! I'm pretty pleased with that under collar! Do make another coat, I'm already thinking about my next one! So beautiful! I'm 64 so I remember the day when I SO wanted a maxi coat but of course my mother said no way, it would be a nightmarish mess by week's end and you can't be cleaning all the time...you know all that mom stuff. But seeing this coat on you a return of that desire to (as you say) swan around until Spring is definitely a way to get through the rest of winter! Love your coat - the button placement, length, collar - a work of wearable art. Thanks Kathleen! Oh, gosh, yes! There were so many things my mum wouldn't let me have!! (Spoil sports) :) I've already discovered that consideration has to be given to the coat's hem - this was after I tried to close it in the front door earlier! But on the other hand, my legs were lovely and warm. Thanks Christine!! I hadn't planned on using four patterns, it just sort of evolved as I went all!! Thanks Helen!! I'm so pleased with that Biba label!! And wasn't The Bee brilliant, can't wait for next week. It's a fabulous coat Lynne - you can see that a lot of work has gone into it. And you're always so good at recreating your inspiration images! I'm planning to start a coat later this week, but it looks like it'll be much simpler than this masterpiece, so I'm hoping I'll be able to wear it in the not too distant future! Thanks Ruth! I really enjoy the challenge of trying to recreate something I've seen. Good luck luck with your coat, it will be fab! absolutely stunning!!! I am in awe of your sewing skills. the care and the time invested in making a coat like this one is inspiring to one like me that does not have your skill. 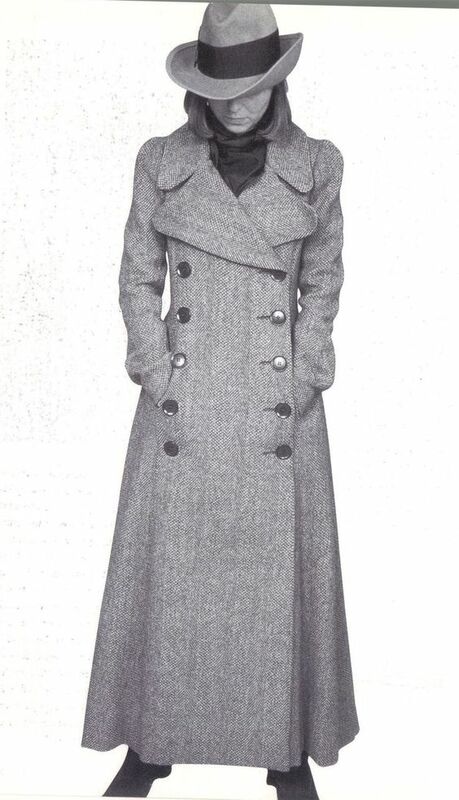 everything about this coat is wonderful..from the fabric to the bound buttonholes to the modifications on the collar. I enjoyed every description and each and every picture. Thank you!! The amount of time it takes to make a coat is definitely the worst bit! And I like to do bound buttonholes because I have more control with them, rather that the machine throwing a wobbly with a buttonhole at the end!